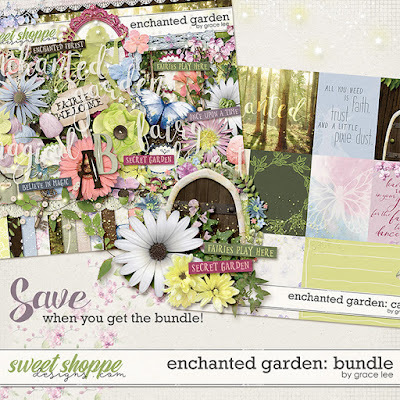 Enchanted Garden: Bundle is inspired by the magic of fairy sprites that enchant spring gardens kissed with dew. Glorious pastels and vellum take us into the secret fairy garden for whimsical layouts that capture magical memories of spring and once-upon-a-time play for all ages. and 86 elements. The elements included are: 1 banner, 2 bows, 2 branches, 1 butterfly, 4 buttons, 2 charms, 1 doily, 1 door, 1 fairy, 15 flowers, 6 foliage, 4 frames, 2 glitters, 2 houses, 1 key, 5 labels, 2 lace, 1 stones, 1 string, 1 swing, 4 tags, 5 titles, 5 word art, and 1 wreath.